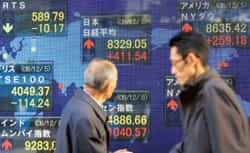 Tokyo/Shanghai: Asian stocks rose for a third day, led by commodity producers and shipping lines, on expectations stimulus plans from the US to India will buoy the global economy and prevent earnings from tumbling. Singapore and Indonesian stock markets jumped at least 4% after being shut on Monday, when plans by US President-elect Barack Obama to boost growth led the MSCI World Index to a 5.5% advance. Gains were limited as Japan’s economy contracted more than estimated and China’s exports shrank. Indian markets were closed for Id-ul-Zuha on Tuesday. The MSCI Asia Pacific Index added 0.8% to 83.73 as of 7:03pm in Tokyo. About nine stocks gained for every seven that fell. The gauge, up 11% from its 20 November low, retreated 47% this year and is set for the worst annual performance in its 20-year history. Companies in the index are valued at an average 12 times estimated profit, about a quarter below the level at the start of 2008. Japan’s Nikkei 225 Stock Average rose 0.8% to 8,395.87. Nomura Holdings Inc. led gains after people familiar with the situation said it will cut jobs in Asia. Sony Corp. climbed 3.9% before saying after the close it will reduce headcount by 8,000 and lower investment in electronics. Decreased spending by businesses led Japan to revise its estimate of third-quarter growth to a 1.8% contraction, more than the 0.4% reported last month. “We need to implement policies to prevent the economy from falling apart," economic and fiscal policy minister Kaoru Yosano told reporters in Tokyo. Governments are stepping up measures to ward off the worst financial crisis since the Great Depression. Obama pledged to enact the biggest government spending programme since the 1950s, while India cut interest rates and announced a Rs.31,900 crore stimulus package. Hong Kong will provide $12.9 billion of loan guarantees to help businesses, Donald Tsang, the city’s chief executive, said late Monday. China’s CSI 300 Index fell 2.6% after an adviser to the country’s central bank said exports dropped last month and industrial-production growth cooled. Futures on the Standard and Poor’s 500 Index lost 0.5%. The gauge climbed 3.8% on Monday, extending its advance from an 11-year low last month to 21%. Copper futures in New York added 9.1%, the most since 29 October, while crude oil sur-ged 7.1% to $43.71 a barrel, breaking a six-day losing str-eak. Oil has dropped 70% from a record $147.27 on 11 July. Mining and material firms are the worst performers this year among 10 industry groups on the MSCI Asia Pacific Index as the deepening global recession diminished demand for commodities.